Attention happy spellers!! 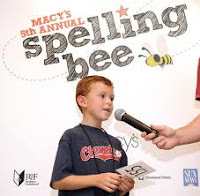 On August 25th, join Macy's and Reading Is Fundamental for the Macy's 7th Annual Spelling Bee, and show them how well you can S-P-E-L-L! Each of the 27 regional Spelling Bee winners will take home some great prizes, including an iPad, a $100 Macy's Gift Card, a tutoring scholarship from Kaplan and an online gift card from Scholastic. How to enter: Contestants must come to one of the above-mentioned Macy's locations on the corresponding date, accompanied by a parent or legal guardian. Registration will open 30 minutes prior to the advertised start time for each event. Participation is limited to the first 50 entrants in each location. Parent or legal guardian must provide written consent at time of entry in order for a child to participate. Contestants must provide proof of age acceptable to Sponsors. Spelling Bee Rules: Sponsors are responsible for selecting words used in the spelling bee. A panel of judges will provide contestants with their words. Contestants are eliminated upon misspelling of his/her given word. The elimination procedure changes when the number of contestants competing is reduced to two,. At that point, when one speller misspells a word, the other speller shall be given an opportunity to spell that same word. If the second speller spells that word correctly, plus the next word on the list, then the second speller shall be declared the champion. The decision of the judges is final. If the second speller fails to spell the word missed by the other speller and the next word, then the contest will continue for one or more additional rounds until the last speller successfully spells a word missed by the other and a second word. Prizes: Twenty-seven (27) Prizes will be awarded, one for each store location, to the winner of that store's Spelling Bee. Prize includes one (1) year of online learning from Kaplan Tutoring, an $150 online gift card from Scholastic, and $100 Macy's Gift Card, and an Apple iPad 3. Approximate Retail Value ("ARV") for each Prize is approximately $1,650. Parent/legal guardian of each winner must sign an affidavit of eligibility, release form and complete a W-9 form. Note that, if actual value of any Prize is lower than the ARV, the difference will not be awarded in cash. Parent/legal guardian of winners must each sign and return an affidavit of eligibility, liability and publicity release. Winners' parents/legal guardians are responsible for all taxes and fees associated with prize acceptance and/or use. Prizes are not redeemable for cash. No substitutions for prizes except by Sponsors in which case a prize of equal or greater value will be substituted. Eligibility: The "Macy's Seventh Annual Spelling Bee Contest" ("Contest") is open to U.S. legal residents between the ages of 8-11 at time of competition. Employees of Macy's Retail Holding, Inc. ("Macy's"), Reading Is Fundamental, Inc. ("RIF"), Kaplan Smart Track ("Kaplan"), and Scholastic, Inc. ("Scholastic") (collectively "Sponsors"), and their immediate family members and/or those living in the same household are not eligible. Contest is subject to all applicable federal, state and local laws and regulations. Void in Puerto Rico and where prohibited by law. Events at participating locations are subject to change or cancellation. Participating Locations and Dates: Contest will be held in the Kids Departments at Macy's Lennox Square Mall at 2:00 p.m on August 25th. Locations and time are subject to change by Sponsors.